As the trial gets underway, check out this interactive timeline that explores the key dates in the case. Day 1 one of the trial featured an explosive opening statement from defense attorney. In a bombshell claim, public defender Jeffery Stein said it was actually Daron Wint's two younger brothers who planned and carried out the May 2015 crime. Prosecutors said they have solid DNA evidence linking Wint to the bloody crime scene. On the second day of the trial against the Maryland man accused torturing and killing three members of a D.C. family and their housekeeper, jurors were shown graphic video depicting blood-spattered rooms inside the family's home after the slayings took place. The video was narrated by Michael Pavero, a D.C. police officer who worked with the Bureau of Alcohol, Tobacco and Firearm's arson and explosives task force. The video, taken by crime scene investigators, shot within about a week after the killings, showed a large bloodstain on the floorboards of an upstairs bedroom where prosecutors said Savvas Savopoulos; his wife, Amy; and their housekeeper Vera Figueroa were held hostage during the two-day ordeal in May 2015. There was blood spattered throughout the bedroom, which authorities said belonged to one of two of the Savapoulos teen girls who were away at boarding school at the time of the killings. The video also showed blood on the sides of upholstered chairs, where prosecutors contend the three adult victims were held hostage and taped to the chairs. In the second bedroom, where the body of 10-year-old Philip Savopoulos was found badly burned, the video showed a charred bed burnt so severely it had melted the coils and appeared to sink into the floor. 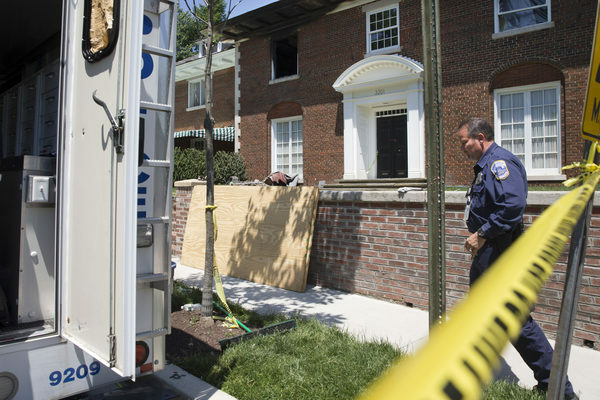 When authorities first showed up to the Savopolous home in Woodley Park in May 2015, they were responding to the report of a fire. Pavero recounted for the jury how he was directed to one of the ambulances at the scene, pulled back the sheet and saw Savvas Savopoulos' bloodied face. At that point, he knew "We were working a crime scene," he said. Pavero revealed the house was held in evidence by ATF for three weeks as crime scene investigators processed the evidence. In questioning Wednesday, Daron Wint's defense pressed Pavero on the large number of people -- firefighters, police, crime scene investigators -- who were inside the home after the killings. Though the point wasn't raised Wednesday, in pretrial motions, the defense has raised questions about potential mishandling of evidence in the days after the bodies were discovered. James Martin, the father of Amy Savopoulos, also testified Wednesday. He told jurors how Amy and Savvas had dated in high school and reconnected in college before marrying. He said his grandson, Philip, who had just recently started school at St. Albans, loved trains and was on the Little League team. As a gift, Martin said he gave Philip a Louisville slugger with his name engraved on it. In opening statements earlier this week, the prosecution -- in a grisly description of the crime scene -- revealed investigators had found two blood-spattered baseball bats in the home that they said Wint used to bludgeon his victims with. Another witness Wednesday was Ghaya Almi, who formerly worked as the director of reservations for Olde Towne Pet Resort in Sterling, Virginia. She said the Savopoulos' two Chesapeake Bay retrievers, Bear and Ginger, were frequent visitors to the resort. Almi told jurors the family had a reservation for the upcoming Memorial Day holiday and she called Amy Savopoulos on the afternoon of May 13, 2015 to confirm them. Almi said she initially tried placing a call to the family's home phone number at 3:14 p.m. but the phone was disconnected. This could be a key detail in establishing when prosecutors say they believe Wint entered the family's home before taking them hostage. Amy Savopoulos was seen walking in the neighborhood at about 3:30 p.m. that afternoon, meaning the intruder was already in the house at that point and had cut the phone lines. (In addition to the phone lines being cut, prosecutors said video from the family's home surveillance system had been taken and never recovered). Later, Almi told jurors she tried Amy Savopolous' cellphone was able to reach her.. "She didn't sound like herself," Almi testified. Normally, Amy was bright and bubbly and usually ordered extras for the dogs, such as swimming services. Instead, she sound like she was under the weather and was rushing to get off the phone, Almi said. At the time of that phone call, prosecutors say Wint had already taken Amy and Philip Savopoulos hostage. The U.S. Secret Service analyzed digital evidence taken from computers belonging to both Savvas and Amy Savopoulos. The computers gave analysts access to the couple's iCloud accounts, which were linked to their iPhones. 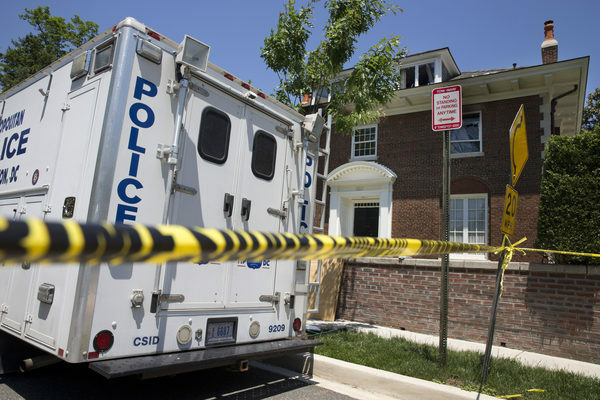 The digital evidence trail begins to provide a bit of a timeline of events on the day three members of the Savopoulos family and their housekeeper were taken hostage and later killed -- but there are still many gaps. Some of the messages are eerie reminders that May 13, 2015 started out as just another day for the family. One of the Savopoulos' teen daughters -- away at a boarding school in New Jersey -- messaged early that morning telling her parents about her prom plans. The remaining messages all came much later in the day -- after the family was taken hostage, according to prosecutors. A message sent late that night -- after 11 p.m. -- contains a reference to the family's home security system. "Savvas -- I believe your cameras record on motion," the message said. It's not clear who the message came from. A message the next morning from Amy Savopoulos to the family's other housekeeper, Nelly Gutierrez reads: "I am making sure you do not come today." The next afternoon, there are messages from neighbors: "your house is on fire! Not a joke" was sent to at 1:33 p.m. on May 14. By that point, prosecutors said all four victims had been killed, doused in gasoline and set afire. A message sent at 1:41 p.m. to Amy Savopoulos' phone reads: "Amy your house is on fire - called fire dept and Savvas please tell me you're OK."
Margaret Pressler, a mother of three and neighbor and friend of the Savopoulos family, testified about the last time she saw Amy Savopoulos. Pressler said she saw Amy walking near Cleveland Avenue and Calvert Street in Woodley Park. She appeared to be heading home. Pressler said she saw Amy at about 3:25 p.m. and is sure of the time because she had just hung up the phone with the surgeon who was to perform knee surgery on her oldest daughter. Pressler said it struck her as odd that Amy was not dressed like knew her neighbor to dress. Normally, she would be wearing athletic clothes, Pressler testified. Instead, Amy was dressed in nice clothes, a skirt and sweater draped over her shoulders and was carrying a large, expensive luxury handbag. According to the timeline being set out by prosecutors, at the time Margaret Pressler saw Amy walking in the neighborhood, the phone lines at the Savopoulos home may have already been cut, per the testimony from the employee of the pet resort who found the number disconnected when she called at shortly before 3:15 p.m.
On the day the Savopoulos family and their housekeeper were taken hostage inside their Woodley Park house, the house had a functioning security system. However, it wasn't fully armed, it could be disabled simply by pulling a plug from the wall and the video surveillance was not being stored in the cloud — off-site servers — but instead on a Dell laptop in an upstairs room with the home's hot-water heater. That's according to testimony from Eric Pellak, vice president of security for SEI Security. Pellak testified his company installed the family's home security system in November 2014 — about six months before the killings — but they were still working out some bugs in the system. For example, a feature that raises an alarm at the sound of breaking glass had triggered a lot of false alarms, Pellak said, convincing the Savopouloses to put in a less sensitive detector. About a week before the killings, Pellak said contacted Savvas about sending technicians out to fully activate — or arm — the system. But the Savopoulos family was out of town and the appointment never happened. On May 13 — the day the family's ordeal started — the system was disarmed, Pellak testified. Late on the evening of the May 13 — during the time prosecutors said the family was being held hostage — Savvas called Pellak with questions about how the security system worked. He wanted to know if video from the cameras outside the home were stored in the cloud. They weren't, Pellak said. Savvas also wanted to know what caused the cameras to turn on. "Savvas — I believe your camera records on motion," Pellak texted him later. Pellak said the call seemed strange, because he said he had already told Savvas about how the security system worked. The two men spoke again on the morning of May 14. Savvas again asked about where video footage was stored. Prosecutors have said the surveillance video stored on the laptop in the home was taken and has never been recovered. It was an emotional day in court as the voice of Savvas Savopoulos played over the speakers. The prosecution played a voicemail he left the family's second housekeeper, Nelly Gutierrez. The voicemail came the night prosecutors say he, his wife, their son Philip and housekeeper Vera Figueroa were being held hostage in their home. In the voicemail, Savopoulos has a friendly tone, telling Gutierrez not to come to the house the next day as she was scheduled to do. "Hey Nelly, Amy has been very sick tonight and Vera is going to stay," Savopoulos said in the voicemail. "Vera's phone died - she doesn't have a charger. I don't know if you can tell anyone who'd be worried about her. Send me a text when you get this message. Thanks Nelly." At the sound of his voice, Gutierrez began to cry on the stand, as did members of the Savopoulos family, who were in the courtroom. A brief break was called. Gurierrez testified that Vera had never stayed overnight before. Earlier, Gutierrez, who knew the Savopoulos family for 19 years, testified about being with Savvas Savopoulos in Chantilly, Virginia, on May 13 to help him prepare for the grand opening of a karate studio Savopoulos was planning to open there. She said she overheard part of the phone call he received from his wife, Amy, around 5:30 p.m. that afternoon. After the call, Savvas told Gutierrez he needed to leave and he asked her to close up the studio, she testified. He said he had to leave because Amy had made plans to go out and he needed to stay home with 10-year-old Philip, who was recovering from an earlier concussion. The next day, the family and Vera Figueroa were found killed inside the burning home. Other testimony Wednesday was far less emotional but helped continue to establish the prosecution's timeline of the crimes. The pizza delivery driver for the Domino's Pizza in Tenleytown testified he delivered two pizzas to the Savopoulos' Woodley Park home on the night of May 13, 2015. He said his manager told him to leave the pizza by the front door on the porch. The customer had paid for the pizza by credit card over the phone -- and added a $5 tip to the total upfront. The delivery driver said he didn't knock or ring the doorbell. He remembered the porch light being on but the inside the house was dark, he said. Prosecutors said DNA belonging to Daron Wint -- the former Savopoulos employee who's been charged with murder in the slayings -- turned up on crusts of the leftover pizza. A Bank of America official also testified about the $40,000 Savopoulos had two employees withdraw from his account on May 14, 2015. Elena Sheppard, who worked at the Bank of America in Columbia, Maryland, said Savopoulos' business, American Iron Works, was a top business client. Sheppard testified that Savvas Savopoulos called her early in the morning May 14 to make a specific withdrawal of $40,000 in cash. He said it was for equipment, she testified. She said it didn't seem like a normal request. Usually amounts that high were electronically transferred. His tone seemed rushed, she said, but nothing out of the ordinary. The chief financial officer of American Iron Works and another Savopoulos company employee went to the Bank of America branch in Kenilworth to pick up the $40,000 that morning. Claudia Alfaro, the stepdaughter of Vera Figueroa, the housekeeper who was taken hostage with the Savopoulos family, provided emotional and harrowing testimony Thursday afternoon detailing how she and her father, Bernardo — Figueroa's husband — went to the Savopoulos home looking for Vera. Alfaro testified that her father called her early on the morning of May 14 when he came home from working the night shift and discovered Figueroa wasn't there. They decided to drive to the Savopoulos' home that morning. Her father told her to stay in the car, she said, then went to the front of the house. "It was all very weird, too quiet," Alfaro testified. "I had a very bad feeling." Her father returned 20 minutes later, pacing. "He leaned in and said 'no one is answering me. Someone is in there and they don't want to answer me.'" He turned to go back to the house when he got a call. It was Savvas. He apologized. He said Amy, his wife, was really sick and that Figueroa had gone with her to the hospital. Savvas said he was going to call the hospital and see how long it was going to be and he'd call Bernardo back. Good morning. The court is not in session on Fridays. The trial resumes Monday Sept. 17 and we'll continue liveblogging the testimony then. In the meantime, we'll recap some of the testimony from the trial's first week: Some of the interesting accounts from various witnesses we didn't get to day-to-day as well as what's next in the trial. Recap: The last phone call? On Thursday, jurors heard from a business owner who runs a lawn-sprinkler company. His company performed maintenance on the Savopoulos family's lawn sprinklers about twice a year and it just so happened a technician was scheduled to come out to the house on May 14 to make a service call. The technician took the stand Thursday, testifying that he showed up to the Savopoulos house on Woodland Drive about 9 a.m. May 14. It was the first call of the day. He rang the doorbell and no one answered, so he left for the next appointment. At the same time the technician was ringing the doorbell, prosecutors have said the Savopoulos family and their housekeeper were being held hostage inside. (About 45 minutes later, the husband and stepdaughter of the Vera Figueroa, the housekeeper, also paid a visit to the house, looking for her). Curiously, the sprinkler business owner testified he received a call from Amy Savopoulos at about 1:09 p.m. May 14. She was calling to cancel the appointment. "She was very nervous," David Arbon, the sprinkler business owner, testified. "She said she had to leave the house. She said her son got injured ... she had to go to the hospital and she had to cancel the appointment." According to the timeline being laid out by prosecutors, that phone call would likely have been one of the last phone calls a member of the Savopoulos family made. Just 15 minutes after that phone call, the D.C. Fire Department was dispatched to the home for the report of a fire. 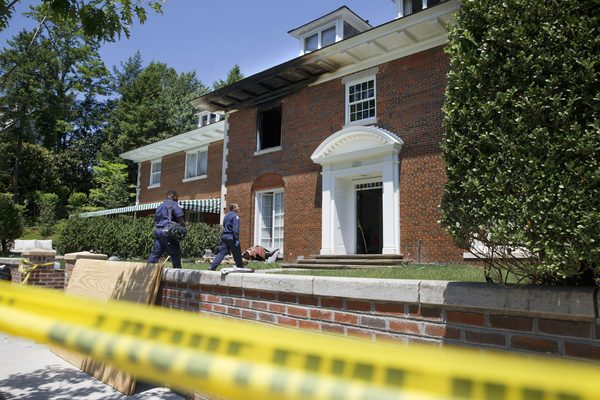 Inside, firefighters would discover the bodies of Savvas Savopoulos; his wife, Amy; their 10-year-old son, Philip; and Figueroa, the housekeeper. In opening statements, prosecutors said the motive for the killings of Savvas Savopoulos, his wife, child and housekeeper was greed. While the family was being held hostage for about 18 hours over the course of May 13 and May 14, prosecutors say Daron Wint, a former employee of Savopoulos' iron works company, forced the businessman to withdraw $40,000 from his bank account. But with Savvas Savopoulos locked up in his Woodley Park mansion over those two days how was the money taken out? Testimony Thursday revealed more details about how prosecutors say it happened. Ted Chase, the chief financial officer of American Iron Works, said he talked to both Savvas and Savvas' sister (who worked as the company's controller) about withdrawing $40,000 in cash and delivering it to his house. The only problem was that Savvas had sole signatory authority to withdraw money so it presented a logistical issue, Chase testified. Chase told jurors he sent Savvas a letter for him to digitally sign, received what's known as a vCard from Savvas to provide to Bank of America. Another issue was that Savvas had sole authorization to print the check, so he even gave Chase his password to print the check. Despite all the logistical hoops he had to jump through, Chase said in his testimony, he didn't find it remarkable. On the phone, Savvas "was perfectly normal — nothing out of the ordinary at all," Chase testified. He said Savvas had never requested he withdraw that much money before, but Savvas' sister wasn't alarmed by it, he testified, so he wasn't either. Chase told jurors that he and another Savopoulos employee — Jordan Wallace, who has been described as an assistant, an all-around "gopher" for Savvas Savopoulos — went to the bank about 9 a.m. May 14. The $40,000 was presented to them in four stacks of $10,000. Chase said the bank didn't have an envelope big enough to fit all the cash, so he separated it into stacks, which he stuffed into his pockets. When they got to Wallace's car, Wallace opened a backpack and they put the money inside, Chase said. Chase testified that Savvas had instructed Wallace to the bring the cash to the family's Woodley Park house. So far, the prosecution has called 17 witnesses in Daron Wint's first-degree murder trail. Next week, the prosecution plans to call to the stand Jordan Wallace, the Savopoulos assisant who dropped the $40,000 in cash off at the Savopoulos' house. His green BMW was found a block away from the house the day the family's bodies were discovered inside the burning house. In the first few weeks of the killings, D.C. police said they were looking into Wallace. Unsealed search warrants revealed police searched Wallace's car, his computer and other items. Police noted inconsistencies in Wallace's story from the beginning and Wallace later told police he lied to investigators during initial questioning about how he received the money and where he left the package of money. However, Wallace has never been named by police as a person of interest and has never been charged. In the opening statements, Wint's attorney sought to raise suspicions about Wallace. But U.S. Attorney for D.C. Chris Bruckmann reiterated that Wallace is not a suspect in the killings. The assistant did "stupid" things -- such as texting a photo of the bundle of $40,000 cash to his girlfriend. But Bruckmann told jurors "at the end of the trial, you all will know Jordan Wallace had nothing to do with this." Also testifying next week: members of Daron Wint's family. Melissa, a reader, wrote in to ask about the two Savopoulos daughters. At the time of the killings, the two daughters were both in their teens and were attending boarding schools out of state. They're both now in college and haven't been seen in the courtroom since the trial started. Savvas Savopoulos' parents and Amy's father have both been in the courtroom for the trial. If you have any other questions about the trial or the case, use the "make a comment" feature at the top of the blog, and we'll do our best to answer it for you. Jurors in the murder trial of the man accused of killing a D.C. businessman, along with his wife, son and housekeeper, heard key testimony from the businessman's assistant, who prosecutors say unknowingly dropped off $40,000 in ransom at the time the family was being held hostage inside. Jordan Wallace, 31, told jurors nothing seemed out of the ordinary when he texted with his boss, 46-year-old Savvas Savopoulos, on May 13 about delivering a package and again on May 14 when he left the bundle of cash inside a car in the Savopoulos garage. During his time on the stand, Wallace told jurors he didn't know and had never met 37-year-old Daron Wint, the man who's charged with first-degree murder in the killings of Savvas Savopoulos; his wife, Amy; 10-year-old son, Philip; and Vera Figueroa, one of the family's housekeepers. Prosecutors say Wint, a former employee of Savopoulos' ironworks company, took the family hostage for $40,000 ransom and then killed them and set the house on fire. Wallace said he was working alongside Savvas Savopoulos at the businessman's soon-to-open karate studio in Chantilly, Virginia, on May 13 and left for the day about 5 p.m. He was supposed to report the next day at the karate studio to get it ready for the grand opening, set for May 15. At some point on the evening of May 13, however, Wallace said he got a voicemail from his boss, telling him there had been a change of plans and that he needed him to report to the American Iron Works office in Hyattsville, Maryland, the next morning to pick up a package. Wallace testified he didn't detect anything out of the ordinary in the voicemail, which was played in court. In the voicemail, Savopoulos sounds friendly and upbeat and even seems to make a joke about Wallace's outdated voicemail greeting. Wallace said he also got a call from Savvas Savopoulos about 7 a.m. the next morning. Savopoulos reiterated what he had said in the voicemail the night before. Again, there was nothing strange about his voice, and Wallace said he didn't hear anything in the background. When Wallace got to the office, he left with American Iron Works' chief financial officer Ted Chase (who testified last week, see below) to head to the bank. At the bank, Chase handed him the bundles of cash — $40,000 in all — and told him, "Guard this with your life." Wallace told prosecutors his reaction was "Holy crap, never in my life" had he seen that much money. He placed the money in a black backpack, he said. At 10:15 that morning, Wallace received a text from Savopoulos telling him to put the package of money in the driver's seat of a sports cars that was parked in the family's garage. He had told Wallace not to knock because he was on an important conference call. Wallace told jurors he had a manila envelope, so he put the cash inside before leaving it in the garage, then sent a text to Savopoulos at 10:26 a.m., saying "pkg delivered." Savopoulos never responded to the message. At first, three little dots appeared on the screen as if he had started composing a reply, but then they went away, Wallace said. As we wait to get more updates from the courtroom about Wallace's testimony, keep in mind defense attorneys for Daron Wint claim it was actually Wint's two younger brothers who planned and carried out the hostage-taking and killings of the Savopoulos family. The defense has also sought to raise suspicions about Wallace's behavior. Though he has never been considered a suspect, police said he did lie to investigators when he was first questioned in May 2015. In opening statements, U.S. Attorney for D.C. Chris Bruckmann stated emphatically that Wallace had nothing to do with the crimes. Megan Cloherty, who's inside the courtroom, reports Wallace's testimony came across as candid and appeared to be received well by the jury. Wallace met the Savopoulos family when he was working as a go-cart racing coach at the Autobahn in Jessup, Maryland, and gave a few lessons to 10-year-old Philip. Wallace was hired by Savopoulos in March 2015 to run errands, drive members of the family to appointments and carry out other odd jobs, such as running an eBay account. Earlier Monday, jurors heard from Bernardo Alfaro, the husband of the Savopoulos family housekeeper, Vera Figueroa. Alfaro, who worked the night shift at a hotel in Bethesda, testified he had a bad feeling when he returned from work early on the morning of May 14 and his wife still wasn't home. "I was feeling something was wrong," he told jurors. He went with his daughter, Claudia. (she testified last week; see below) to the Savopoulos house in Northwest D.C. to look for his wife. They arrived at the house about 9:30 a.m., Alfaro said. Nobody answered when he knocked on the door, but he had a funny feeling. "I feel somebody was in the house, because I heard a little noise inside," he said. He described the noise sounding like a chair scraping on the floor. Then he got a call from Savvas Savopoulos, who told Alfaro his wife, Amy, wasn't feeling well and had to be taken to the hospital and Figueroa went along. Alfaro said he tried to call Savopoulos back to ask what hospital the women were at, but no one answered. Savvas also didn't say where he was when he made the call. "He told me everything was OK."
Good morning, Jordan Wallace, the Savopoulos family assistant, is back on the witness stand today. As we wait for updates from WTOP's Megan Cloherty, who's in the courtroom, we'll recap some of his testimony from Monday. Under questioning from defense attorney Jeff Stein, Jordan Wallace told jurors he texted his girlfriend a picture of his backpack full of cash and later deleted it. Police found the photo after Wallace willingly handed his phone over to police and they searched it. According to testimony presented to jurors, Savvas Savopoulos, the CEO of American Works, asked his assistant, Wallace, to drop off a "package" at the Savopoulos home in Northwest D.C. on the morning of May 14. That's during the time prosecutors and police say Savopoulos, his wife, son and housekeeper were being held hostage inside. The package turned out to be $40,000 in cash. Wallace: My job is insane. Don't show anyone. Wallace told jurors he deleted the text exchange almost immediately because he was afraid Savvas Savopoulos would see it and would feel disrespected or as if it were a breach of trust. What does the "auction" reference mean? Earlier on Monday, Savvas Savopoulos' sister -- who worked as the controller of American Iron Works -- testified she got a call from Savvas on May 13 about withdrawing anywhere from $35,000 to $50,000 from his account. She told jurors her brother frequently attended construction auctions and the amount of cash he was requesting was not all that unusual. It was unusual, however, that he requested it all in cash, Debra Ann Masser told jurors. Still, her brother sounded "perfectly normal" on the phone, she said. On Tuesday, we heard testimony from two workers at the residence of the Australian ambassador, which is across the street from where the Savopoulos house was located. (The actual house was torn down in April 2017). The workers both said they saw a man matching the description of Daron Wint approaching one of the doors of the two-car garage and then slipping inside. The sighting happened shortly after noon on May 14 -- just an hour and a half before firefighters raced to the house for the report of a fire. One of the workers said he found the sighting "unusual." Earlier in the day Tuesday, Jordan Wallace, Savvas Savopoulos' assistant, answered more questions from prosecutors. Being questioned by Assistant U.S. Attorney Laura Bach, Wallace said he got key details wrong when he first talked to police. For example, he told police the sports car inside the Savopoulos garage where he left the $40,000 in cash was locked and he had to retrieve a key from inside a chest of drawers in the garage. Now, he remembers the car was unlocked, he said. Wallace also forget to tell detectives that he had received a voicemail from Savvas Savopoulos the night before about delivering the package to the family's Northwest home. Detectives learned of the call after Wallace willingly handed over his phone and pass code for them to search it. "Were you trying to get it wrong?" Bach asked Wallace. "No, ma'am," he replied. He told police it had been a long day. He was confused and scared when he talked to police. "It was a lot," he said. And what about the manila folder mix-up? Why had he told police he was handed the money inside a manila folder when — based on the picture he texted to his girlfriend and later deleted — it had actually been given to him in two loose bundles, which he placed in his backpack? Wallace told jurors, he put the large envelope in his car on the morning of May 14 when he found out he and American Iron Works chief financial officer Ted Chase were headed to the bank and that he had just misspoke when he told police it had been handed to him that way. He said he mentioned the manila folder specifically because he wanted to make sure police knew what they were looking for. Overall, Wallace said he was concerned about police treating him as a suspect. In video of his interview with police played in court, Wallace is animated and, at times, distraught. By the end of the interview, detectives say they're suspicious to them. They said they didn't believe a bank would just hand over $40,000 like Wallace told them. Wallace was never officially considered a person of interest and was never charged with any crimes, and prosecutors have said they now believe Wallace never had anything to do with the killings.